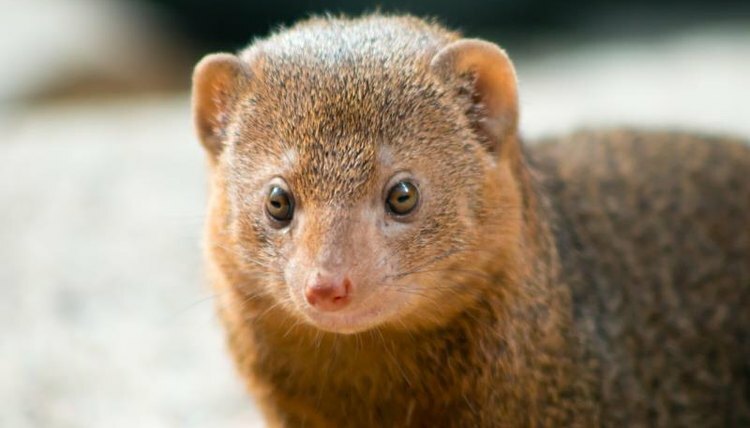 The dwarf mongoose (Helogale pervula) is a very social mammal that resides in sub-Saharan Africa. Dwarf mongooses are the smallest members of the mongoose family, and like their larger cousins, dwarf mongooses are ground-dwelling predatory carnivores. Though they are diminutive in stature, dwarf mongooses use their social skills and cooperative behaviors to successfully thrive in their often dangerous habitat. As their name implies, dwarf mongooses are among the smallest carnivores native to Africa. From head to tail, the average male is only between 7 and 12 inches in length and weighs less than 1 pound. Dwarf mongooses are covered in dense fur that can range in color, but is typically brown, speckled gray or reddish. Dwarf mongooses are stockily built, with short pointed faces and a long tapered tail. Dwarf mongooses are native to sub-Saharan Africa, specifically from Ethiopia southwest to Angola, and south to South Africa. These small carnivores prefer open savannahs, brush, mountain scrub and semi-arid woodlands. Generally a dwarf mongoose habitat includes termite mounds, which the mongooses can climb to watch for signs of danger. Each individual mongoose social group has a range or territory of about 5 acres, but they will occasionally move outside of this range to seek prey. Dwarf mongooses’ complex social structure is headed by a single dominant female, her mate with whom she forms a monogamous pair and who is second on the social hierarchy, and their offspring, usually totaling between 12 and 15 individuals. Mongooses form a matriarchal hierarchy, with females dominant over males in their age group. Within this social structure, only the dominant pair of mongooses breed, allowing their older offspring to help care for the younger. Young dwarf mongooses do not leave the group until the matriarch dies, at which point they split to form or join other social groups. Being highly social animals, dwarf mongooses maintain contact with the other members of their group throughout their day. While they disperse to forage for food -- including insects like termites, beetles, locusts and grubs, as well as the occasional small vertebrate, egg or fruit -- dwarf mongooses maintain vocal contact with their group, calling out with short chirps and other vocalizations. According to the Saint Louis Zoo, dwarf mongooses are also attuned to the calls of hornbills, a family of large birds with whom they share a symbiotic relationship. As hornbills fly over the dwarf mongooses’ territory, they will sound an alarm call if a potential predator is near, allowing the mongooses to seek cover. In return for their safety alerts, the hornbills eat insects that are stirred up as the mongooses forage in the grasses. What Is the Dwarf Chameleon's Ecosystem? What Do Hyenas Do During the Day? What Are the Courtship Habits of Flying Squirrels? How Do Sloths Find Their Mates?